Justin Zehmke takes a look at Estonian service culture and finds it lacks one key element – good service. “Tere,” I greeted the woman behind the counter in my best “I only know one word” Estonian. Her eyes flickered up at me momentarily but her expression did not change, nor did her body language. She might as well have been holding a placard bearing the words “leave me alone” instead of her mobile phone. The problem was that I was there to buy a bed, and she worked at the furniture store, so leaving her alone was not one of my favoured courses of action. I’d been wandering around between the various beds and mattresses for about 15 minutes, hoping that one of the store employees would come to my aid. I’d forgotten where I was. So, I approached the one glued to her seat behind the counter, the tinkling noises of Candy Crush being played poorly emanating from her lap letting me know what was occupying her attention. This was met by the type of sigh that said I was being highly intrusive and it would have been better for both of us if I’d never been born. I’d heard this sigh before, in fact, I’ve been hearing it my entire life. It’s the sigh a parent gives when you bring home a poor report card or the sigh a child gives when a parent makes bad jokes in front of the kid’s friends. Fifteen minutes later I had a piece of paper that I needed to take down to the cashier so that I could pay for the bed. All in all, the experience took about 40 minutes and made me feel like an intruder and time-waster. I couldn’t help but contrast this with the equivalent experience in South Africa. A salesperson would most likely have intercepted me on my way to the bed section, asked what I was looking for and then tried to sell me a bed costing three times what I just told them I was willing to spend. He or she would eventually concede and sell me the one I wanted. We’d both be smiling and friendly throughout, even though we would be intensely aware that this was just for show. Still, I would get the desired result quickly. From walking into the store to paying for my purchase would take no more than 10 mins. Customer service and Estonia are not two terms that belong in the same sentence. They definitely can’t be found at any shop, store or restaurant in this country (of course this is an exaggeration). But with an increased reliance on tourist income and a young population that is well travelled and globalised, I need to find out why this is the case. Why do waiters, shop assistants, clerks, receptionists and salespeople treat customers like a massive inconvenience, often actively hiding from them? “Communism, my friend, pure and simple,” according to my friend Max. This is his stock answer to any question regarding the weirdness of Estonia. He posits that, during the Soviet occupation, only collaborators and those connected to the communist party ran shops, supermarkets and restaurants. This automatically bred antagonism between them and their customers. Add to that the fact that there often was no choice to be had – whether in price, variety of goods or service level – and you have a recipe for disaster. Customers without choice, served by people they saw as traitorous assholes who knew they had a captive market. Once you throw in the general reticence of the Estonian national character, you have the perfect storm. In Estonia, the customer is not always king. In Estonia, the customer is always a nuisance. Of course, I know there are exceptions, so please don’t bombard me with examples. These simply prove the rule. Estonians don’t get even the most basic of concepts of customer service. As an example, I regularly find myself in massive queues at supermarkets, where only two tills are staffed during the after-work rush. Other supermarket employees are scattered around the store, casually stocking shelves, mopping floors or just chatting amongst themselves. The Estonians simply abide these queues, slack-jawed and calm, like cattle waiting for the bolt outside a soundproof abattoir. If ignored for long enough, outright mutiny would erupt in five minutes max, with people dumping their groceries everywhere and loudly stating that they’re never coming back to this place. Why the cowed acceptance of poor service? You may counter that there are self-help check-outs. And this is true, but when there’s a queue on these it’s even worse. I come close to losing my mind when some confused middle-aged person tries to scan the wrong side of their plastic bag for the tenth time if I’m in a hurry. I expect this would be the case in many other countries too, so why not here? Why the cowed acceptance of poor service? “It might also be that we’re so used to poor service, we don’t expect anything else,” she concedes. In fact, I’ve seen some interesting research that shows Estonians actively prefer this lack of service. Give them a shop with helpful attentive staff and quick queues and they’ll stay away in droves. They want to be left alone, however difficult that makes even basic things like paying your bill in a restaurant. There’s definitely a part of me that admires this. Pushy salespeople are absolutely horrible, I know, and the Estonian insistence on personal space and privacy even in public spaces is lovely. That said, it really shouldn’t take me an hour to buy a bed. I’ll bear all of this in mind the next time I have to go find a waitress who’s hiding in the kitchen of a restaurant so that I can order a drink or basically beg a salesperson to take my money, but I draw the line at the supermarket queues. The next time I have to wait 20 minutes while Martin and Mia stand in the back of the shop flirting silently rather than manning a till, my inner South African is coming out and I’m letting them know exactly where to stick their groceries. Loudly. The opinions in this article are those of the author. 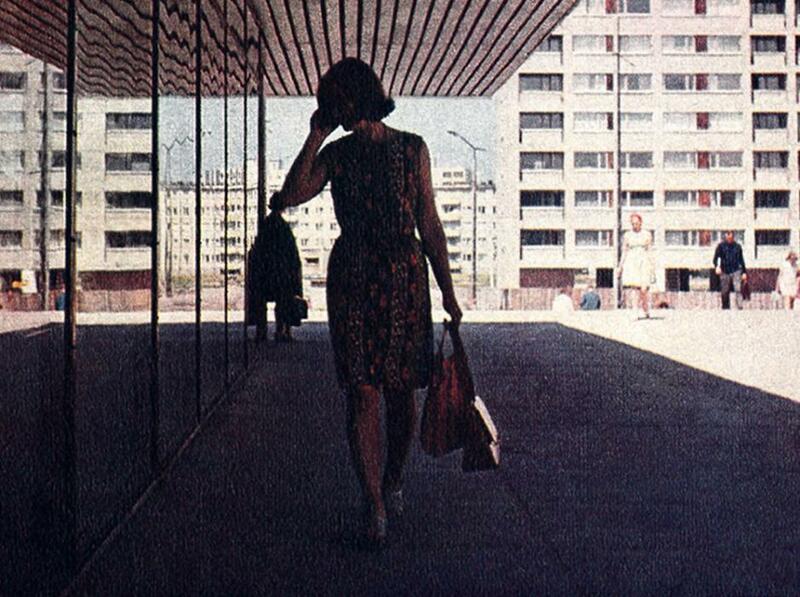 Cover: A Soviet-era shopper in Tallinn.